Photo courtesy of Bruce Templeton. 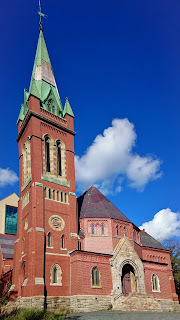 The week's Memory Store video comes to us from St. Andrew’s Presbyterian Church otherwise known as the Kirk. Bruce Templeton tells the story of the burning bush in relation to the Presbyterian Church and how the burning bush medallion of an earlier church survived the fire of 1892.